The average guy might be surprised to know the true age of their body. These days, it is not uncommon for someone age 30 to be measured by the biological age of 80. If you want to keep yourself young, vivacious, and healthy, Raymond Francis has a simple health model he’d like to share with you. 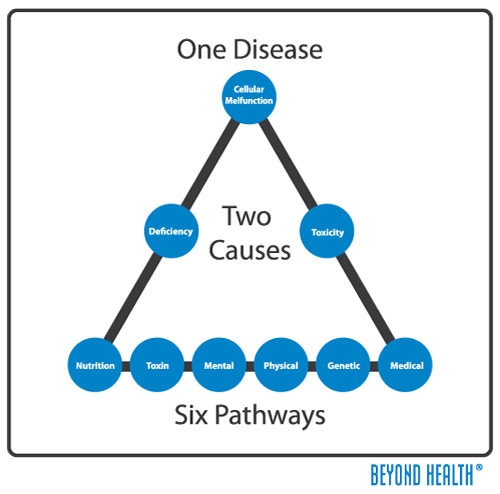 The Beyond Health model is shaped like a triangle. Up top you have the one disease. In the middle, you have two causes. At the bottom, there are six pathways leading to disease. “We are a community of trillions of cells acting together,” explains Francis. “If all your cells are operating as they should—it is impossible to get sick.” The only way you can get sick is when a large number of cells malfunction, and they only malfunction for two reasons. Either they are not getting everything they need, or they are being exposed to something that is interfering with their normal function. Francis calls these two problems, deficiency and toxicity. “There are two cities—one city called health—the second is called disease,” explains Francis. “You’ve got six interstate highways connecting these cities—If you are heading towards disease on all six pathways, and you’ve got the accelerator floored, you are in real trouble (he laughs).” More than three out of four people have a diagnosable, chronic disease. More than half of the population is on prescription drugs, and things do not appear to be getting any better. Your best course of action is to take control of the wheel, and put yourself back on the road to optimal health. There are six pathways to health you’ll need to familiarize yourself with. Nutrition– What you put into your body, is what you’ll get out of it. Junk in, equals junk out, and vice versa. If you deliver what the cells need daily, you can expect them to function at an optimal level. This means reducing your consumption of foods that offer little nutritional value (fast food, packaged food, etc.) and increasing fresh, organic, whole foods. Toxin– Toxins interfere with the normal function of cells. Most of us know not to digest radiator fluid or rat poison, but there are a number of toxic foods that are unknown by the common population. “80 percent of our pesticide load comes from two sources,” explains Francis. “Meat and dairy.” You should cut dairy from your diet, because it is unnecessary, and if you must eat meat, make sure it is organic. Mental– “Do thoughts affect our body?” asks Francis. “Absolutely.” When you chronically produce stress chemicals, you use up a lot of critical nutrients, which creates deficiencies in the body. Those stress chemicals also build up, creating a toxic effect. Negative thoughts are like poison, which is why it is important to learn the techniques of positive thinking. Medical– “The 15 percent of medicine that is based on science, works, and is miraculous,” explains Francis. “The 85 percent that doesn’t work can kill you.” This means taking a front seat to your healthcare, and following up with questions to your doctor about a diagnosis and treatment. Some aspects of medicine are helpful, while others are hurtful, and it is fundamentally your responsibility to make the best decision.